Ah, technology. 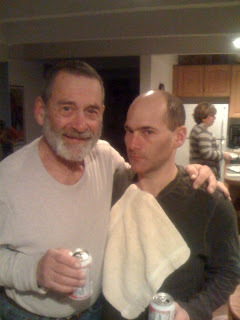 David Kann is in colorado with my folks and brother and his family. He snapped this picture after dinner on his Iphone, sent send and here it is, for your viewing pleasure. Dixie is truly the six million dollar man, just wrapping up a month or more of daily powder skiing, with his new hip, bladder and rotator cuff.. not to mention is single wing form, as he needs another rotator cuff operation. Wish i was there!